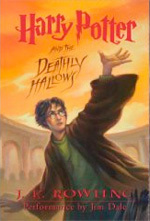 Like the rest of the series, this book relies on the reader having read the other books first. There are a few hints to catch people back up if its been awhile since you read the last one but not enough to make it a stand alone book. The author has faithfully followed the characters as they grew from children into young adults. As promised from the start schooling for wizards lasts seven years. That Rowling has chosen to gracefully bow out with a timely finally rather than milk the audience for more money shows a certain level of class. Of course if a prequel about the founding of Hogwarts were to come next year or so I think most fans would accept it gladly. Many have complained about the number of deaths faced by characters during the series, especially the deaths of known and loved characters. In reality for a child of eleven to not have lost someone they knew is a rarity. For a child living in a time of war it is an impossibility. As much as we would like to believe our world is a happy place free from the terror and fear face by these young children, Rowling has used the classic mode of fiction to lay unpleasant truths in front of us for all to see. While occasionally the action scenes seem confusing and stilted that can be excused by the fact that these are not trained soldiers but merely children fighting for their lives in a war older than they are. Harry and his friends are finally coming into their own as young adults making their own decisions. They aren't all good ones. Choices are made and questioned. Friendships are strained as characters change. As befitting a story of this magnitude there is even regret and forgiveness. Any author that has a notable fraction of the world’s population gladly lined up at midnight to read a 759 page book not about a celebrity deserves some credit. Rowling was fair to the characters and fair to the audience. I give the book four stars. This collection of Mirror Universe stories includes glimpses of what could have been for Hoshi, Spock and Picard had their world been a little different. It brings to mind the phrase “There, but for the grace of God, go I”. I bought the book because Hoshi and Spock are two of my favorite characters but it was Picard’s story that made me laugh. The authors did well with keeping most of the characters true to form. They also managed to explore how different some characters would be given different oppertunities. Some character placements are a little harder to believe, much like some of the shows that were mirror universe based. Hoshi is a woman of vision. Her talant of understanding people easily extends into manipulating them. Earth had conqured a number of local races. There is a rebellion in the works and even an ally’s word is worthless. With neither side having a moral high ground it comes down to individuals trying to survive. It’s not betrayal unless you trusted them first. Many high ranking Vulcans have seen the illogical waste in a system that advances leaders through murder and warfare. Spock has gone a step further and decides to destroy the Empire before it can self destruct. He doesn’t promote peace so much as capitalism. It’s easier for the Empire to accept. The only part I didn’t like was with all the focus that was put into Carol Marcus and what she helped do, we never saw the outcome. I hope that was merely a case of it hasn’t happened yet and will show up in the next collection. Picard unleashed. Without the rigors of command and the regulations of Starfleet exactly what would Picard do with himself. Play in the dirt of course, we’ve seen that on the show. What I didn’t expect was Vash. Sure it makes as much sence as anything else but Greg Cox handled her well. Then he brings in the Borg. It’s not all fun and games. There was a very well done moment in battle with the Klingons too. As we’ve seen with Star Trek before, especially with the Mirror Universe, you can’t look too closely and expect it to hold together. The stories themselves were well done. I give the book four stars. As part of the 40th anniversary celebrations of Star Trek in 2006, Pocket Books put out a series of special commemorative books, including this particular volume in November. 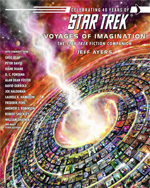 Voyages of Imagination: The Star Trek Fiction Companion is an essential addition to any collector of Star Trek original novels. 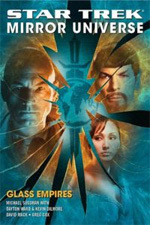 The large trade paperback book is a complete chronology of all of the original fiction that has been professionally published in the Star Trek universe since the days of the original series in 1966-69, starting with the original James Blish adaptations of the classic series scripts and going through mid-to-late 2006. The book takes the format of presenting a detailed plot description for each novel (or short story collection), including date of publication of page count, in the order in which the books were published. This alone would make it a handy reference book for Star Trek fiction fans. What really makes the book an essential part of my collection is that Ayers has make an excellent effort to contact all past Star Trek fiction writers and do brief interviews with them, covering their experiences writing for the Star Trek milieu. Thus, as sidebars to many (if not most) of the book descriptions, we are treated to authorial recollections about the writing of each book. Some of these comments may be brief -- one or two sentences -- and some of them may be several pages in length. Some are rather disillusioning, as authors share less-than-fond memories of their experience, while some of the commentaries add immeasurably to the Star Trek reading experience. This book is broken down into logical sections -- Bantam Books, Ballantine Books, and then the bulk of the content focuses on Pocket Books, the exclusive Star Trek publisher from the early 1980s to today. The Pocket portion is then broken down further to focus on each specific Star Trek series in its own section. Mini-series, anthologies and episode adaptations each get their own sections as well. A special treat at the back of the book is an extensive timeline, assembled by a large number of collaborators, which attempts to place all professionally published Star Trek fiction into a cohesive chronology. I may have a few quibbles about how some of these novels are positioned in that timeline, but in general it is very well done and a useful tool for fans wanting to look for novels set in a particular era of Star Trek -- for instance, the second 5-year mission of Kirk's Enterprise. All in all, I found Voyages of Imagination to be a fascinating read, and although I had pretty much stopped reading Star Trek original novels by the mid-1990s, the descriptions and author commentaries here have convinced me to try to track down some of the earlier Star Trek titles that I had passed on. For obsessive Star Trek fans, this is a must-have title. For those with a middling interest in Trek fiction, you may appreciate the author commentaries and recommendations. And for those who don't read Star Trek novels, this definitely won't interest you either. Coming in a season loaded with "threequels" (Spider-Man 3, Shrek 3, etc. ), Pirates of the Caribbean - At World's End had the daunting task of trying to impress viewers more than its theater-dwelling brethren. While all of its cannons may not hit their targets, I still found At World's End to be a fun and entertaining film, and a generally satisfying conclusion to the trilogy. At the end of the muddle that was Pirates of the Caribbean - Dead Man's Chest, Captain Jack Sparrow and his beloved ship The Black Pearl had been sucked beneath the waves by Davy Jones' pet Kraken, and the survivors of Jack's party had found themselves allied once again with the thought-dead Captain Barbossa. 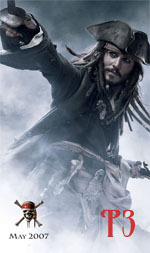 At World's End sets in motion a perhaps-overwrought plot - Barbossa's plan to rescue Jack from the purgatory of Davy Jones' Locker, for Barbossa needs Jack to complete a set of the 9 Pirate masters for a piracy summit. The summit has been called because the East India Trading Company, with the naval power of the British Navy at its disposal, has been wiping out piracy on the high seas. Meanwhile, conflicted loverbirds Will Turner and Elizabeth Swann each have their own reasons for also wanting to rescue Jack -- Will seeks a way to release his father from eternal servitude to Davy Jones aboard the Flying Dutchman, and Elizabeth wishes to atone for her traitorous turn against Jack in the previous film. What follows is over 2 1/2 hours of high seas adventures, constantly shifting loyalties and witty, sarcastic dialogue, broken up by hallucinogenic scenes of Jack's purgatory -- in which he is surrounded by dozens of...himself...as the rest of the crew of the Black Pearl. At World's End is more successful in recapturing the character chemistry of the leads than Dead Man's Chest was, but also suffers from the second film's fatal flaw -- the near-constant separation of the main characters from each other. Jack, Will and Elizabeth are at their best when playing off against each other, and this film's storyline continually pulls them apart from each. Thankfully, a capable supporting cast, led chiefly by Geoffrey Rush's return as Barbossa, almost makes up for this storytelling flaw. Dozens of new characters make their first (and last) appearances in At World's End, including the other 7 of the Pirate masters (other than Jack and Barbossa), and the nefarious British officers and East India Company representatives out to wipe out all of the pirates. One other element I disliked in Dead Man's Chest was Johnny Depp's over-the-top performance as Jack. In At World's End, I found him to be slightly toned down in comparison. It was also fun to have a short cameo by Keith Richards (Depp's inspiration for his performance) as Jack's father, Captain Teague. With stunning special effects, spectacular music, top notch performances and a story that held together surprisingly well, I'm happy to say I was quite satisfied with Pirates of the Caribbean - At World's End. The only major drawbacks for me were the continued separation of the main characters, the lack of a legitimate payoff in the film when the nature goddess Calypso is returned to her natural form, and a somewhat bittersweet resolution to one of the major character relationships. Despite its flaws, I still give At World's End 3.5 stars. 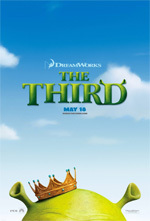 Critics have been savaging Shrek the Third as another example of this summer's series of bad threequels. I can't say that I agree -- I found this film to be quite entertaining. It's not as "new" or groundbreaking as the first of the Shrek films was, by any means. In fact, the original Shrek (and even Shrek 2) tried to break the rules on how to tell an animated fairytale story. By this third film, there's not all that much new ground to break. Nevertheless, Shrek the Third tackles the subthemes of "coming of age" and "taking responsibility" admirably. Faced with the prospect of having to take the thrown of the kingdom of Far Far Away when his ailing father-in-law passes away, Shrek prefers to settle down in his muddy swamp with his wife Fiona to live happily ever after. This necessitates the enaction of Plan B -- locating the only other natural heir to the thrown, young Arthur, and transporting him to the capital city, convincing him that he should be King along the way. Complicating matters is a rebellion, led by the deposed Prince Charming, and a variety of animated movie bad guys (Captain Hook, the Cyclops, the witch from Sleeping Beauty, etc.). Shrek the Third is a mild entertainment. We already know all of the characters (for the most part), so the jokes are sort of "built in" to the established relationships. Minor characters are given their moments to shine -- My favorite part of the film is when a bunch of the supporting characters are about to be tortured by the bad guys and the Gingerbread Boy's life flashes before his eyes in hilarious detail. Overall, I found Shrek the Third to be a fine, if predictable, entry in the Shrek series, though it's also obvious to me that they've wrung just about as much storyline out of these characters as they can. Better to stop now, before the films become too tired.